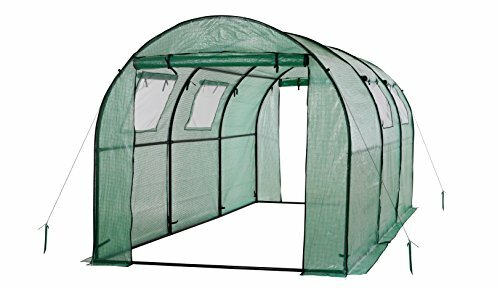 This spacious walk-in tunnel greenhouse is the perfect solution for the real gardener out there who wants to grow the garden all seasons of the year. Featuring a durable mesh PVC cover which protects from direct sunlight, is waterproof and UV resistant; and a sturdy powder coated steel tube frame. This product also features 2 ventilated windows on each side to provide your plants with indirect sunlight and terrific flow-through ventilation. 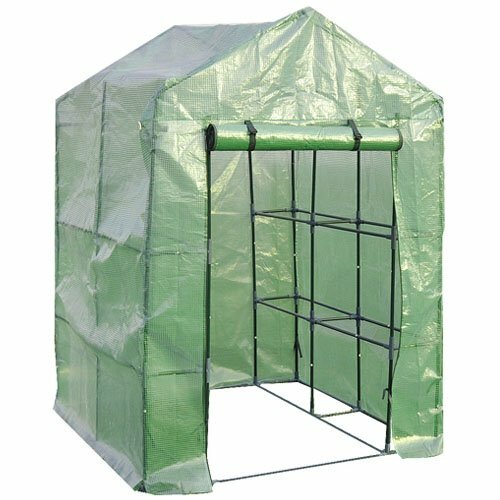 It has a wide roll-up cover at each end for quick and easy walk-in access, additional ventilation, and moisture control. With doors at each end, you can even line up more than one for extended greenhouse gardening. It is designed with push button connectors for easy assembly of the base frame, and includes all necessary hardware to build up the full structure. The super-strong anchor kit included with this purchase will help keep your greenhouse firm against the wind. Includes a set of 4 plastic anchors combined with guy ropes to anchor the corners, as well as 16 metal anchors for anchoring along the perimeter. With all these fantastic features, it will undoubtedly protect your plants from too much heat or cold, shield plants from dust and gale, and help to keep pests out!